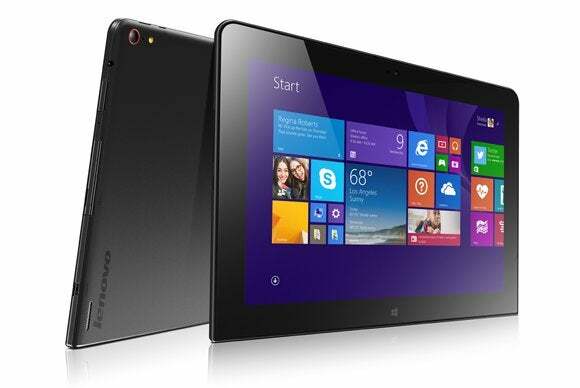 Lenovo’s ThinkPad 2 was a great tablet, but Intel’s older Atom platform struggled to run Windows 8 smoothly, the tablet itself was chunky, and its screen had fewer pixels than the smaller, but newer ThinkPad 8. The ThinkPad 10 brings all of those old spots up to spec without sacrificing any of the great quality or productivity perks of the ThinkPad line. Pulling the ThinkPad 10 out of its box, I was struck by how thin and light, yet solid it felt. The ThinkPad 10 is the thinnest of the current crop of larger screened Windows tablets we’ve seen, just edging out the new Surface Pro 3 (0.35 inches vs 0.36 inches). It’s quite a bit slimmer than both the Asus Transformer Book T100 (0.39 inches) and the Dell Venue 11 Pro (0.4 inches). The tablet weighs a scant 1.32 pounds, feeling much more like my iPad Retina (third-generation) than either the Dell or Asus. The 1920x1200 display is easily the ThinkPad 10's best feature. The soft, matte plastic back is not quite the grippy, soft-touch texture of older ThinkPads, but it still feels nice in the hand. There's a little flex to the screen because it’s not a metal back, but not a worrisome amount. Speaking of the screen, the 1900x1200 pixel resolution is a joy to work with. I really appreciate the extra space over a 1080p screen and find that, even at only 10.1 inches, I’m comfortable with the scaling turned down some to fit more on the screen. The brightness range is also wide, going from bright enough to compete with window glare to dim enough to read in the dark without burning out my retinas. The faster Atom in a thinner package can heat up at times. Ports are mostly hidden behind little doors, which, while less convenient, leaves the edges cleaner-looking. On the right side is an open micro USB/headphone jack, and behind a door you’ll find a SIM card slot (ours didn’t have WWAN, but it will be available on certain models) and a microSD slot. Behind door number two on the left is a full-size USB 2.0 port in addition to the port for the power adapter. Yes, a full-size USB port and a real power port. No clogging up the microUSB with either of those. The Quickshot cover is a must-have accessory for the ThinkPad 10. One odd design decision is the mismatched corners. The bottom two corners are square, more in line with the boxy ThinkPad aesthetic, and they fit well in the various docks. The top corners are more rounded, as if Lenovo just couldn’t commit to square corners all around. The square bottom corners do feel awkward to hold after a while, so despite how seamlessly they fit in the dock, it may have been better to round all the corners. Lenovo chose to stick with the Atom-class processors in the ThinkPad 10, but they're taking advantage of the fact that the Z3795 is 64-bit capable. Even though our review unit has only 2GB of RAM, there is the option to upgrade to 4GB with 64-bit Windows. You can purchase models with either 64- or 128GB of storage. It should be noted that the faster Atom in a thinner package can heat up at times. The tablet stayed cool when I was just writing or browsing, but the right-hand side got uncomfortably warm several times while I was performing more intense tasks. As much as I like the Ultrabook keyboard, the tablet reclines too far back in its dock to be usable. Despite having a slightly faster Atom processor than the similarly equipped Dell Venue 11 Pro, the ThinkPad 10 performed just behind it on most of our benchmark tests. Both tablets come out ahead of others outfitted with the more common Atom Z3740 chip, like the Asus Transformer Book T100 and the Acer Switch 10. 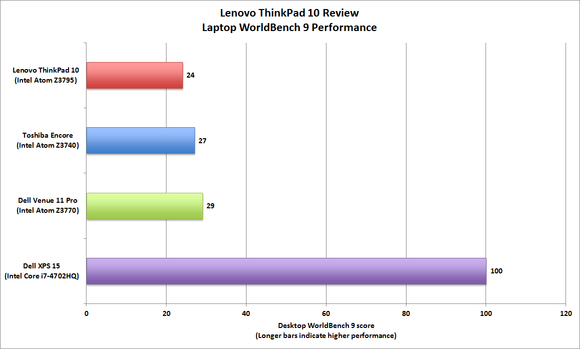 The ThinkPad 10's benchmark performance is on par with other Intel-powered Windows tablets, although it finished slightly behind Dell's Venue Pro 11. Battery life on the ThinkPad 10 is good for a light day’s work, lasting 5 hours and 45 minutes—that’s just 11 minutes longer than the Dell Venue 11 Pro. Our battery rundown test is particularly harsh, so you might get better results. Dell still has the advantage though, as its mobile keyboard dock comes with an extra battery that significantly boosts its runtime. The ThinkPad’s Ultrabook dock ($129) does not have a battery option. 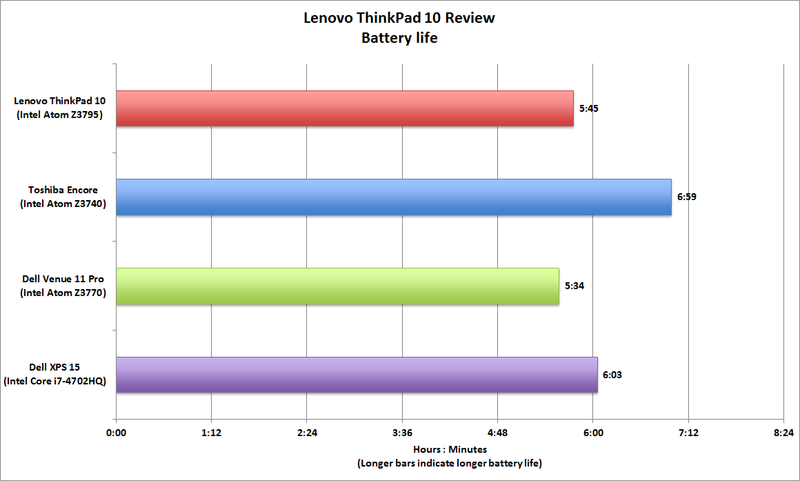 You should be able to get a full day's work out of the ThinkPad 10's battery. What the ThinkPad Ultrabook keyboard dock does have is some fantastic keys. They are a little close together, which took some getting used-to, but the travel and feedback are right in line with what I’m used to from ThinkPad keyboards. Once I adjusted to the spacing, I was happy typing all of this review and several other things on it. 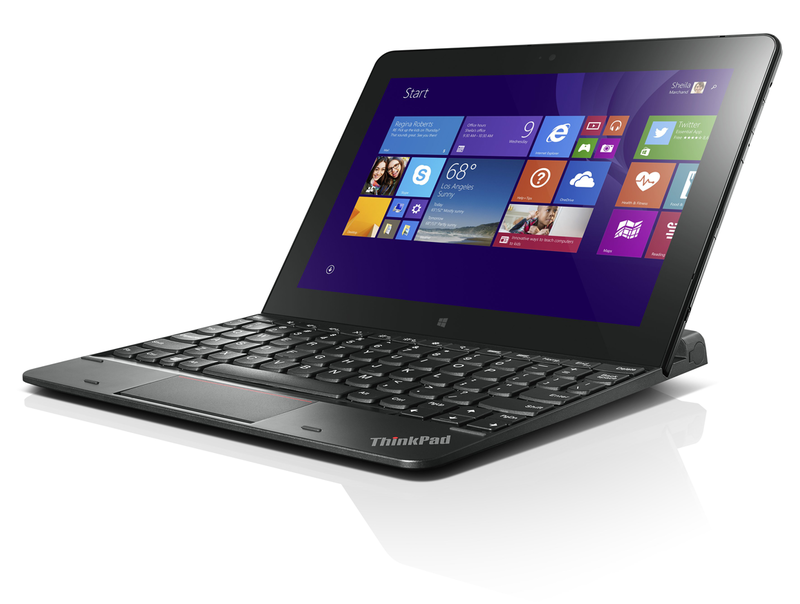 The Ultrabook keyboard is not a clamshell-style dock, like that of the Asus T101t or the Dell Venue 11 Pro. The tablet just sits in a groove in the back, held by magnets. You must take the tablet out and slot it into a different groove in the back to cover the screen for travel. It's unfamiliar, but the motion to close it is not too different from that of closing a clamshell. The problem is that the docked tablet is stuck at a fixed angle, tilted way too far back for my taste. 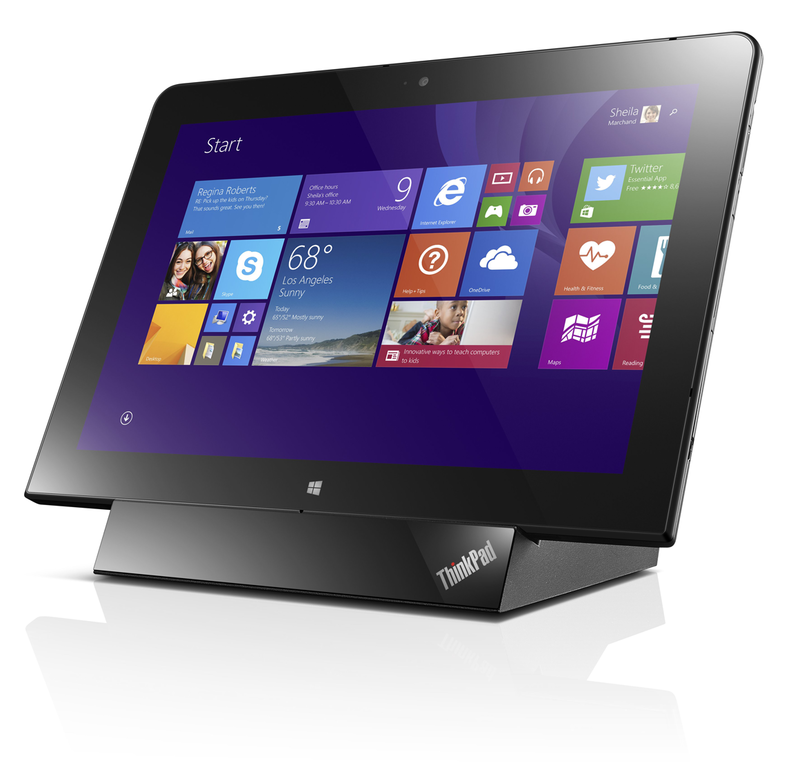 The $129 tablet dock converts the ThinkPad 10 into a miniature all-in-one PC, with the option of connecting a second display. There is also a desktop dock available, which holds the tablet at a better angle and provides two USB 3.0 ports, a full-sized HDMI port, and ethernet. The tablet slots onto a physical connector that sticks up and can be tricky to seat properly. I left it on the dock for a few hours thinking it was charging, only to find it wasn’t quite all the way on. 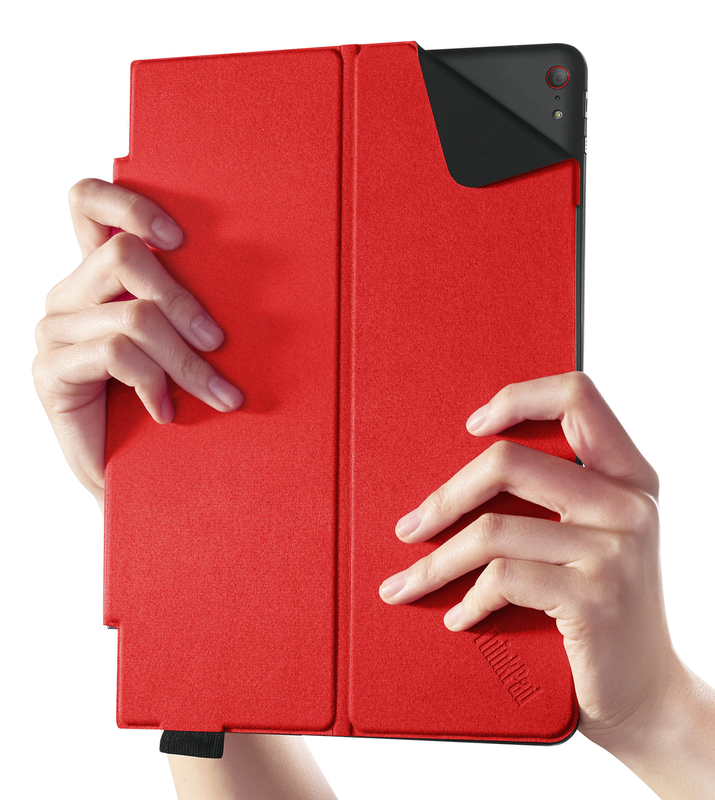 Lenovo also makes a Quickshot cover ($45) for the ThinkPad 10, which is every bit as nice as the one that goes with the ThinkPad 8. I find using the camera on a 10-inch tablet to be a bit gimmicky, but the 8MP rear camera takes nice shots, and the Quickshot cover makes it easy to get into the camera app to capture a moment. The cover folds in the middle to prop up the tablet at a range of good table-use angles. It attaches magnetically using the same guide holes as the various docks, so you must take it off to dock the tablet. The included digitizer pen is a great note-taking tool for apps such as Evernote. 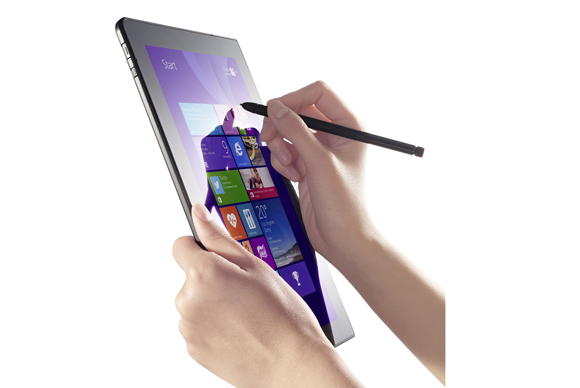 Last, but not least, the ThinkPad 10 comes with a digitizer pen. The battery-less pen writes and draws smoothly with no lag. There is no pen garage in the tablet, but there is a garage in the Ultrabook dock, and there’s a pen loop on the Quickshot cover. The ThinkPad 10 ticks a lot of the right boxes. The most important element of this tablet, its screen, is top-notch. The Atom processor is more than capable for everyday tasks, especially with a 4GB RAM option. A wide array of accessories covers the majority of use cases and input preferences. The only thing holding me back from scoring this tablet higher than its closest competition, the Dell Venue 11 Pro, is the fixed angle on Lenovo’s Ultrabook dock. It was that annoying to use on a table with the screen tipped so far back. 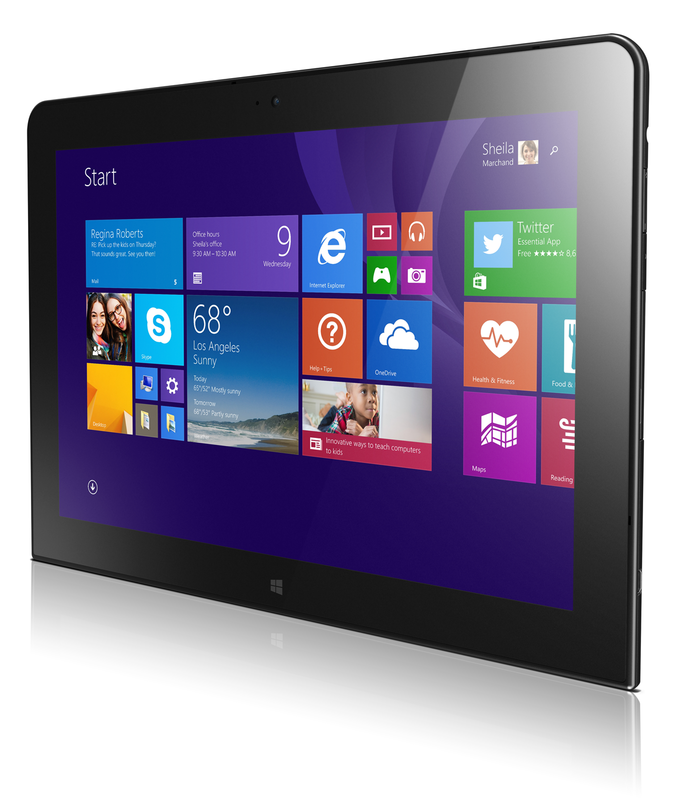 If I had to buy one or the other, I still lean toward the ThinkPad 10. But I’d pass over the Ultrabook dock in favor of the Quickshot cover to hold the pen and prop up the tablet. Then I’d need to find the ultimate Bluetooth keyboard to go with it. Lenovo's latest productivity and business-oriented ThinkPad tablet checks all the right boxes on paper and is a joy to use in real life, but it suffers from a few ill-conceived design decisions.